Costa’s continuous expansion means it’s always a challenge to recruit good Managers and their talent pipeline had run dry. With further expansion planned and the launch of its new Metropolitan brand, an attraction strategy and recruitment messaging refresh was required. Whilst important not to loose site of Costa’s main brand USP – the quality of its coffee – our employer brand research showed that many people were not aware of the career development opportunities available to them by joining Costa. This, plus the chance to manage a newly branded Metropolitan store formed the cornerstones of our messaging. 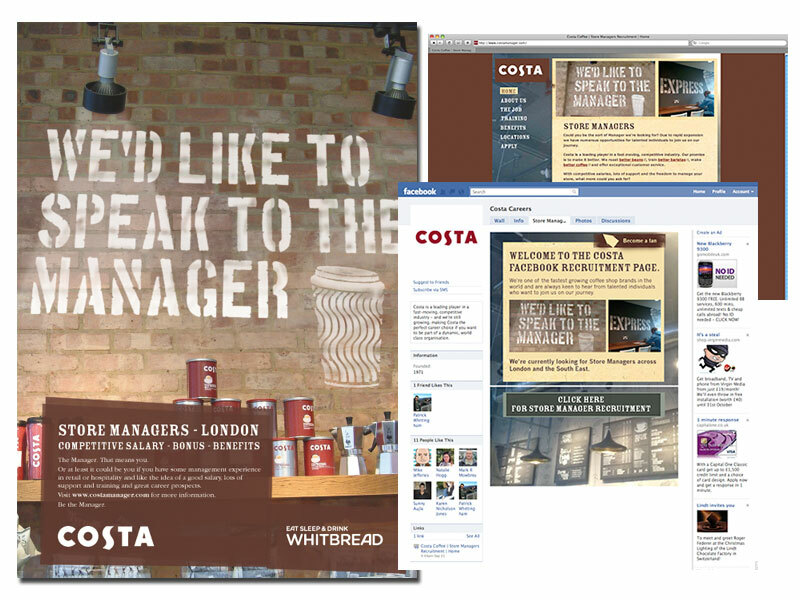 A multi-media schedule was devised to target existing retail Store Managers in the London area with the skills to run a Costa outlet, including in-store posters, off-line and on-line media, an extensive pay-per-click social media campaign, a bespoke Facebook page and a campaign microsite. A simple and direct message ‘We like to speak to the Manager’ – a phrase instantly recognisable to the target market – was used as the headline message. A photo shoot at a newly refurbished ‘Metropolitan’ store at Great Portland Street provided the imagery and the Metropolitan brand ‘wall stencil’ effects replicated for the concept headline. The campaign ran for 14 weeks and over 1500 unique visitors visited the campaign site with 300+ ‘likes’ on the Facebook page. Over 20 Store Managers were recruited during the campaign and the collateral from the campaign – specifically the in-store posters – is still in used to this day.